NEW YORK - Tonight, CC Sabathia will be making his 24th career postseason appearance, and 23rd start, in Game 4 of the American League Division Series. Of course, with someone at the stage of his career Sabathia is at, wonder starts to creep in if this may be his last - especially now, given that the Yankees that must win tonight to even see tomorrow - but CC has an answer to that in part. 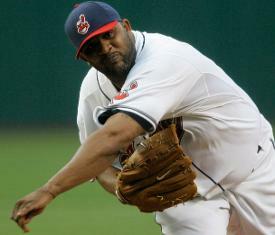 "I definitely want to play next year," Sabathia smiled Monday night, "and I'll play anywhere. I still want to pitch. I definitely can help and still get guys out. So whoever needs me, I still want to play." Of course, CC was asked in his pre-start briefing, which happened well before the Yankees were blown out in Game 3 and put down two games to one in the series, how his postseason experience will help him Tuesday night, and the general answer was that he won't get lost in the moment. Within that, though, he was also asked what he remembers about his first postseason start, way back in Game 3 of the 2001 ALDS, and as it turns out, CC's quality start (six innings of two-run ball) in his October debut was thanks in part not necessarily to him or his catcher. "You know what I remember about that game? Me and Einar Diaz couldn't get on the same page with pitches, and I was kind of all over the place in the game," Sabathia said. "Robbie Alomar came to me in the dugout after the second inning and said, 'Don't shake off Einar anymore the rest of the game. I'm calling the pitches from second base.'" Sabathia is now the respected veteran in the clubhouse, hoping that the advice he gives young players is adhered to - but even then, as a brash 21-year-old, CC knew better than to ignore a veteran teammate, especially a future Hall of Famer like Alomar. "He was calling pitches from second base, giving them to Einar, and that's what I was throwing," Sabathia said. "We ended up winning 17-2, so it was a good night!" That win put Cleveland up two games to one on the 116-win Mariners, who eventually rebounded to win the series in five, and CC didn't get another postseason start until 2007, his final year in Cleveland. Here's to Yankees fans hoping that Sabathia can re-live that performance tonight with Gary Sanchez, and his current team can come back the same way Seattle did.